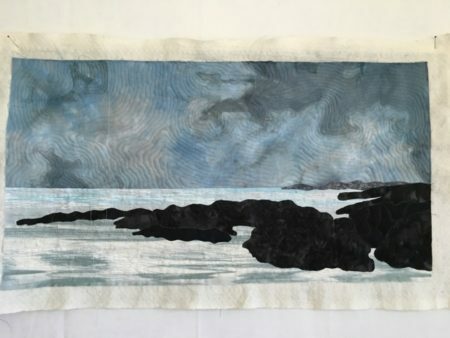 My current interest in a series of art quilts on seas and coastlines has created an opportunity to play a bit with skies. 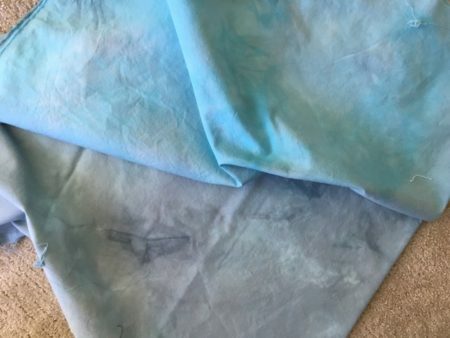 I have been dyeing cloth to create different moods of skies. 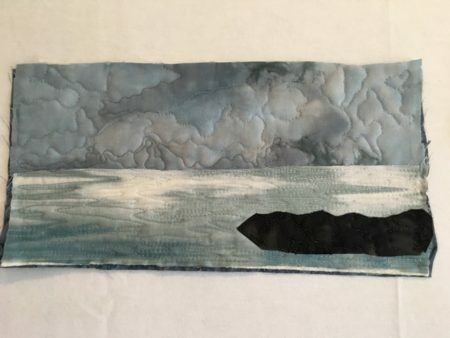 If you remember, my last art quilt ,which I have decided to call After the Storm, used some cloth I dyed in Elizabeth Barton’s class earlier this year to portray that sky. For this latest dyeing adventure, I worked from the formula I used in Elizabeth’s class. 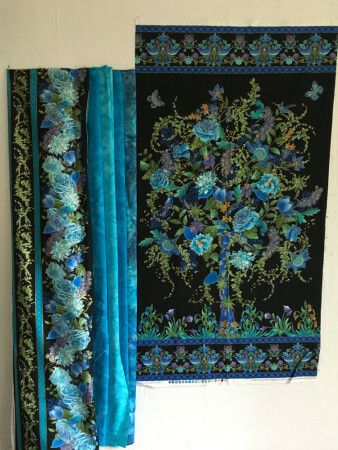 For one piece, I overdyed a blue with a black (upper piece) and then reversed the process to overdye black with blue (lower piece). My next step will be to play with ‘cooling down’ the blue by adding a touch of green. 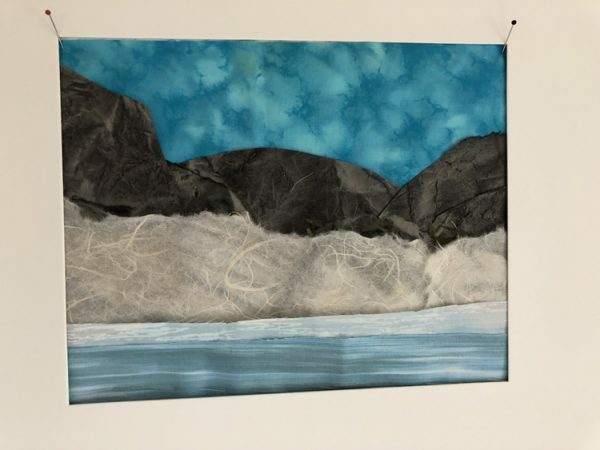 While I was working through that dyeing process, I also continued to assemble the pieces for the art quilt that I mentioned in this blog back in April, based on Kerstin Hellman’s photo of the Irish coastline. 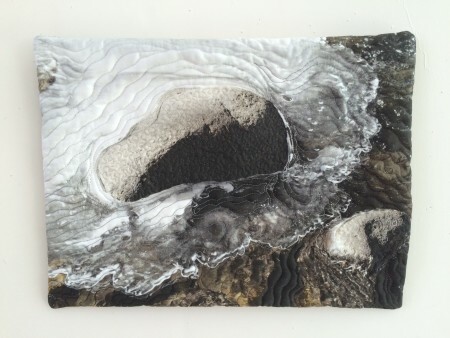 What I have decided is to create two separate art quilts from Kerstin’s photo as the sky and most distant rock formation in my ‘draft’ totally captivated my attention. This week’s project then was to develop that first piece. Using another piece of fabric from Elizabeth’s class for that sky, part of my process this week was to sample quilting for the sky. 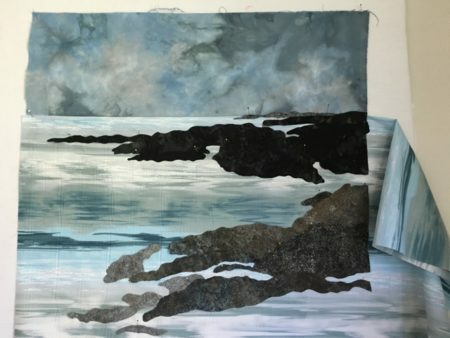 I created a mini-landscape to test out quilting for the rocks, sea, and sky. 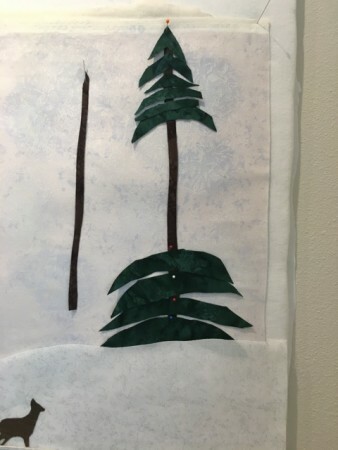 I wasn’t satisfied with the quilting technique for the sky in the mini. So I tried an echo technique similar to what I used in After the Storm to highlight the branches against that sky. 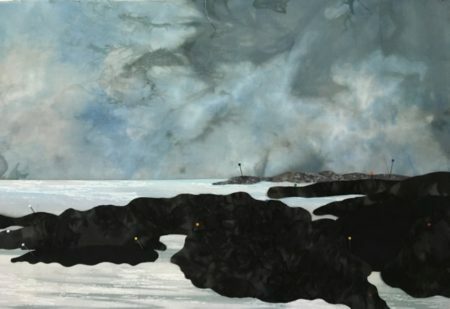 Using that approach to highlight the ‘storm clouds’ in the sky felt much better in the sample so it is what I used for my actual piece which is now in process. 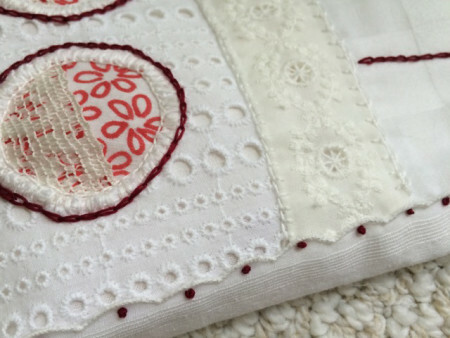 I think you will agree that the echo quilting was the way to go! Linking to Nina Marie’s Off the Wall Friday so please check out what other artists have been up to this week. 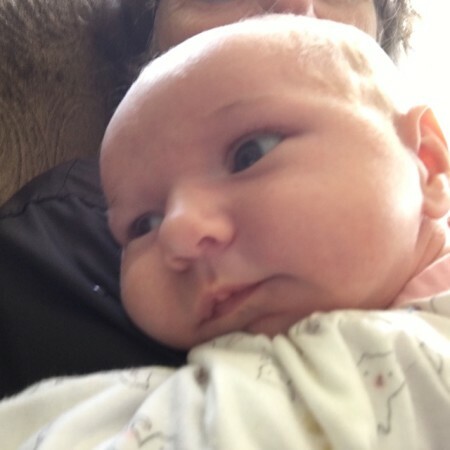 When you are 5 weeks old, it is natural to be in the present moment. A shoulder to lean on creates contentment. If only we could all stay so present and find contentment in where we are currently in our lives. As always, this week provided its own challenges to being in the present moment for me. But, moving forward one step at a time with my art, it really was a good week. 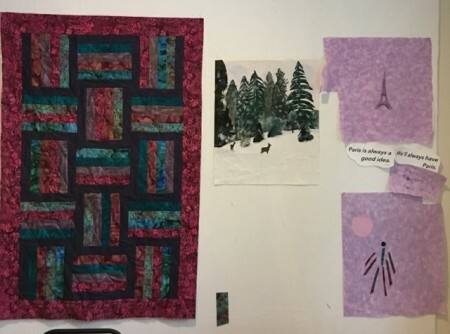 A note from my contact person at Quilts Beyond Borders revealed a definite need for quilts to fill requests from India, Ethiopia, and for Syrian refugees. This spurred me on to work not only with some fabric provided by Quilts Beyond Borders but also to delve into my stash for other ideas. Some fabric squares I picked up at Ikea a year or so ago magically formed a base for a second quilt top. At the same time, my mind was busy with ideas for my next art quilt. 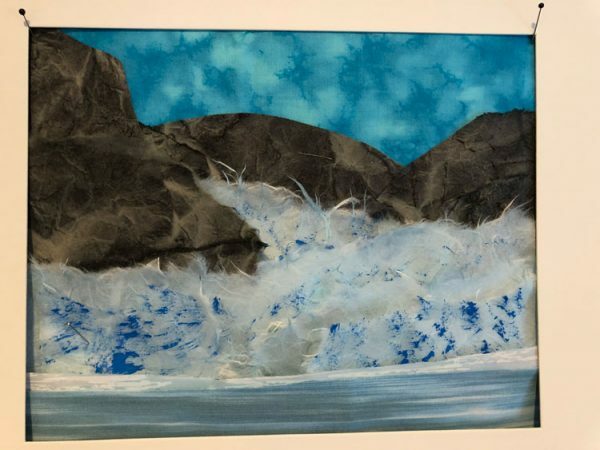 I enjoyed working on a sea theme so much in my last piece that I have decided to do a series. 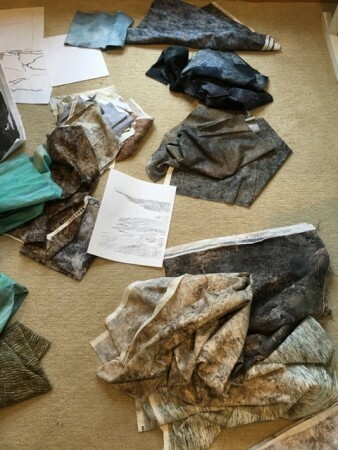 Taking inspiration from a photo of the Irish coast, my studio floor is now laid out in possible fabrics. With luck, I will be sharing more in the coming weeks on this exciting project. And, finally, I leave you with a breath of spring. 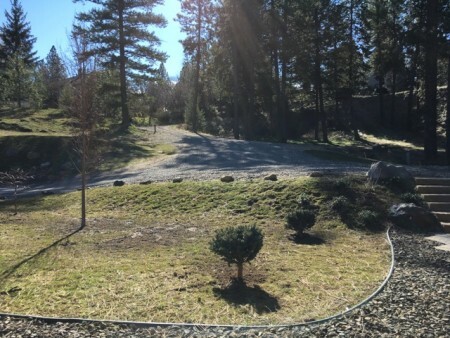 The weather in Spokane has been absolutely perfect the past week and spring is definitely in the air. 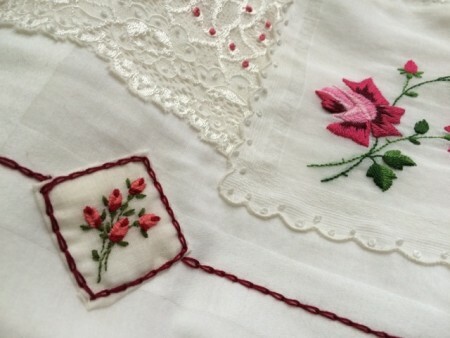 My hand stitching simply could not resist celebrating the re-emergence of wild flowers around our property by taking on a flower theme on this delicate antique cloth I have been working on. Linking to Nina Marie’s Off the Wall Friday blog. they feel a little guilty because they didn’t really do it, they just saw something. they’ve had and synthesize new things. In my quiet moments, I often smile in wonder at how the various parts of my life come together. When I worked with Tom Crum for many years, we called it ‘following your center’. Creativity comes from following your center, just trusting it will all make sense in the long run. 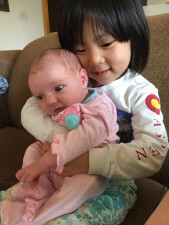 We decided to look for a second home out west, now we have one two minutes from our grandchildren including a newborn. We had no way of knowing when we made the initial decision this would be the outcome. We just sort of trusted and how great is this outcome! 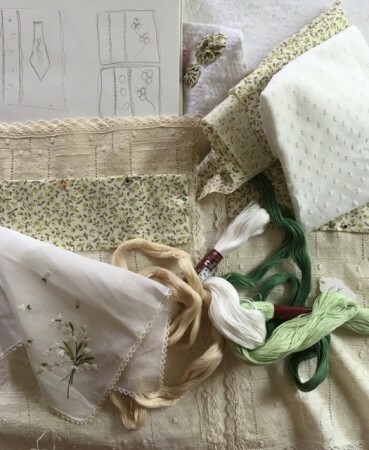 The assorted threads and fabrics are beginning to create a new pouch with the overwhelming feel of homespun cloth as the base – a piece of vintage linen found at an antique mall in upstate NY. 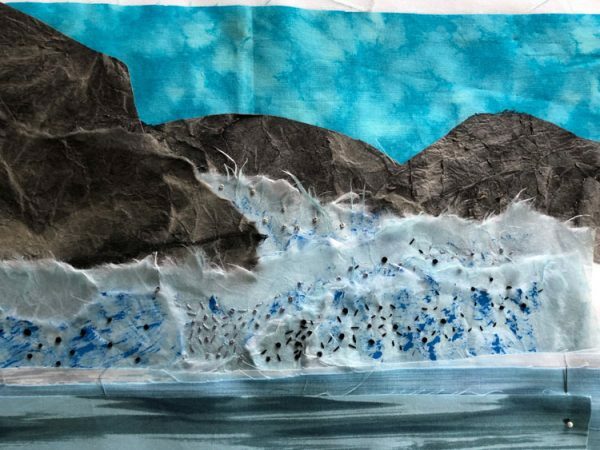 On the art quilt front, the seascape of last week now has been pieced and fused. 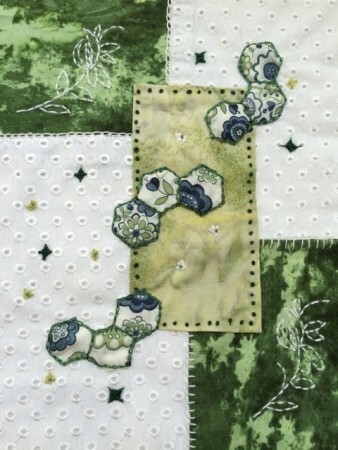 Next steps are to play with shading, stitching/quilting. And, then there was that piece of cloth that I picked up at Undercover Quilts with the intention of using in a quilt for Quilts Beyond Borders. 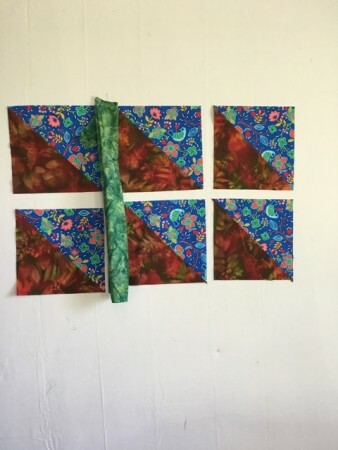 It has found a complementary partner in my stash and is currently being cut and pieced , and I hope to have another quilt to send on to Quilts Beyond Borders in the coming weeks. Hope that your creativity is flowing as well. Linking as usual to Nina Marie’s Off the Wall Friday, so you can see what others are doing. 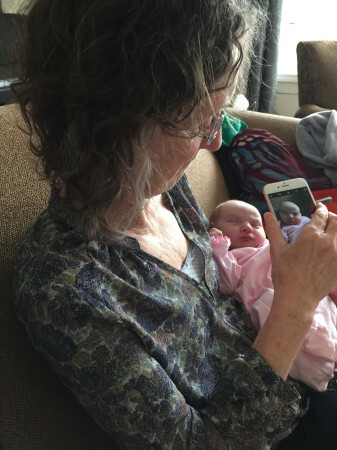 As Miriam learns what it means to be alive, I spent much of the past week enjoying her presence and recording it for pleasant memories. Happily, while Miriam was developing, spring also emerged enough that it was possible to begin to plant our front yard. I now can sit on a bench by our front door and watch our plantings also grow. Back in the studio, the theme of patience was ever present. Obviously, Miriam has cut into studio time. However, two of the three projects I hoped to begin on have begun to emerge. 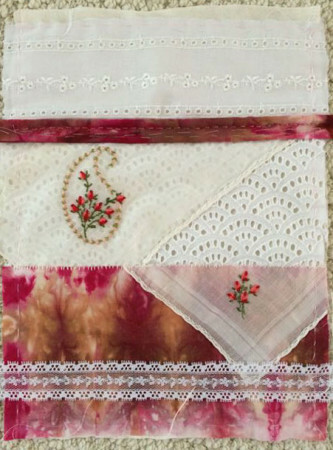 This collection of thread, hankies, and cloth will become my next ‘pocket’ as I finish up my “Patched Pockets” class with Karen Ruane. Since April brings some travel with it, this pouch will be my ‘stitch as you go’ project. 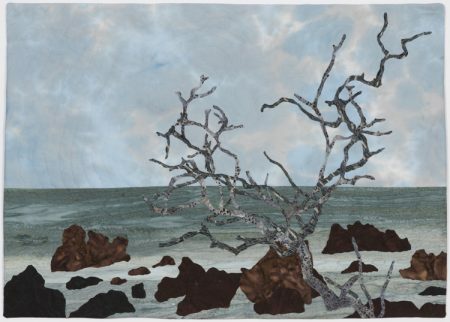 Finally, I have made inroads into my next art quilt. 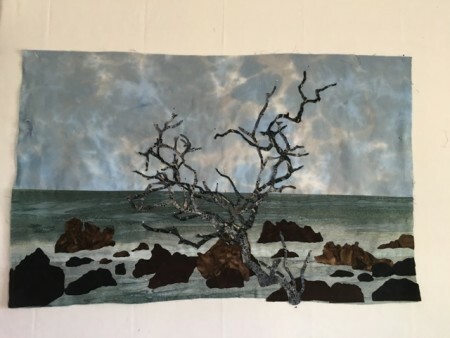 Some fabric from my favorite Seattle fabric store, Undercover Quilts, and some of my own hand dyed fabric created a backdrop for a sea scape I have been wanting to create. At the moment, possibile rock candidates are pinned to the background. 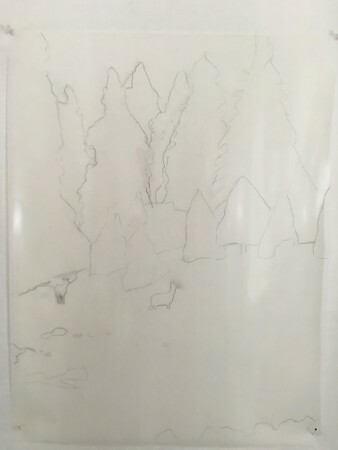 I have a template for an amazing piece of driftwood that will eventually rise to the sky from those rocks……next week will focus on exploring fibers for that wood. 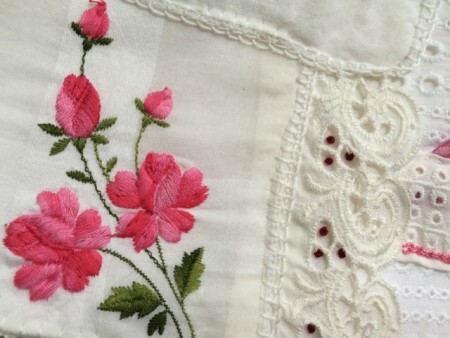 I am sure as this quilt evolves, Miriam will remind me to be patient. Whenever I begin an art quilt, I am my worst critic. 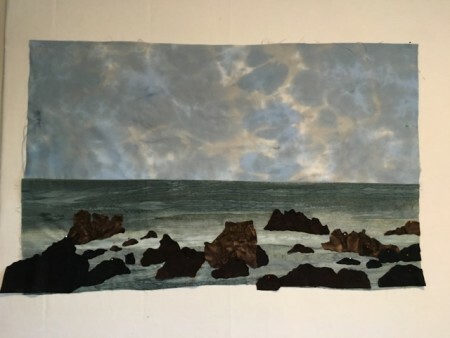 That backdrop hung in pieces for many days while I contemplated and critiqued. When I began to add the rocks, I was dubious, but I persisted. I have learned that I need to move forward and then step back and let it set. 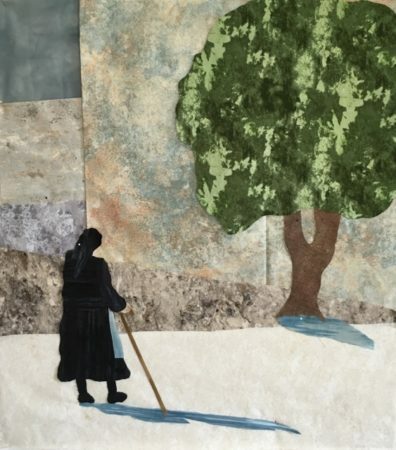 If I have the patience to listen, the art quilt will tell me what works and doesn’t. Hope that you have all had a good week. If you have time, stop over and visit NinaMarie’s Off the Wall Friday blog and feast on some inspiration. While I sketched and perused photos for another art quilt, I looked through all the fabric that I moved out here from New York. 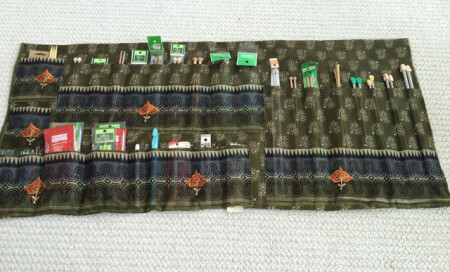 Many of the pieces were purchased for I thought I saw the potential for either an art or bed quilt. 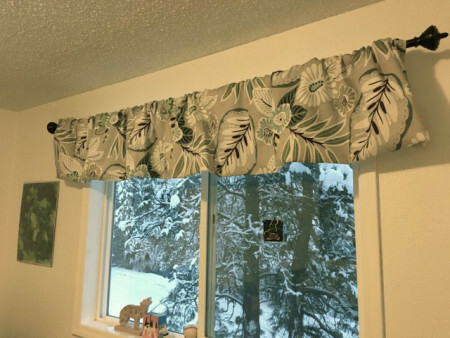 One possible project revolved around a center piece I picked up at one of the Rochester guild sales..and some border fabric I then purchased to accompany it. 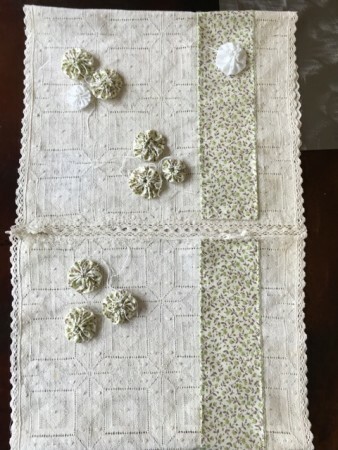 Last week I pinned both on my wall and then looked through my stash for other complementary fabrics. It became quite an exploration! 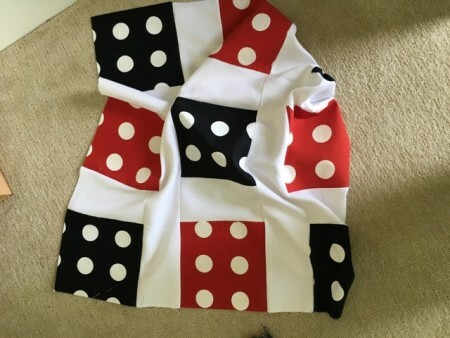 After a bit of measuring, drafting a design, and weeding through fabrics, I was closer to a workable project. It also was becoming clearer to me that the borders on the center piece were going to have to exit. 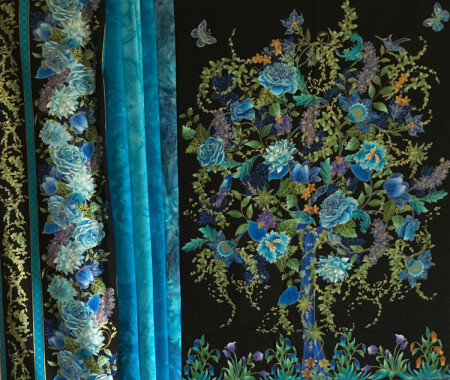 The blue lines simply did not coordinate well enough with my turquoise fabrics or the turquoise line in the outer border. A little cropping of my jpg gave me a better idea of the workability of my idea. 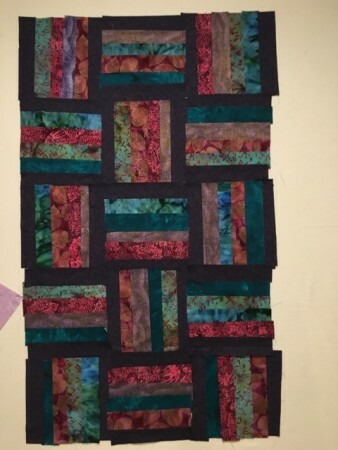 With borders trimmed, I started piecing to create a new border around the centerpiece. Those mitered corners turned out to be much than easier than anticipated. 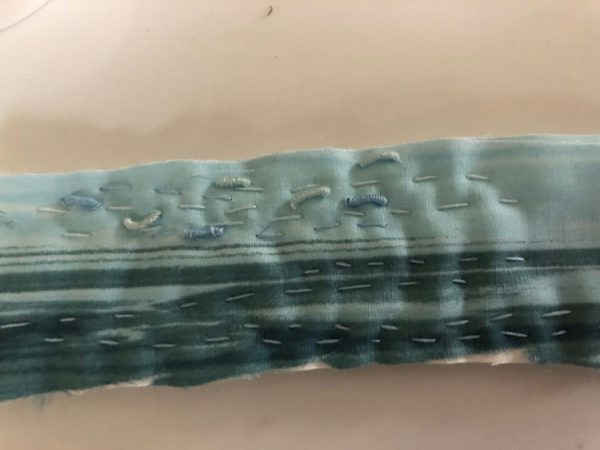 I pieced all the turquoise strips into a 8 1/2″ wide strip and then attached that to the center. 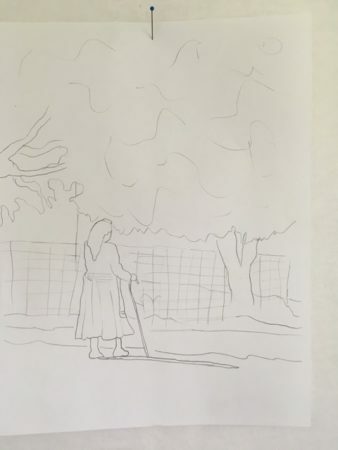 I found that tracing a 45 degree angle on the wrong side of one border and then matching the adjoining border to that line created clean corners. 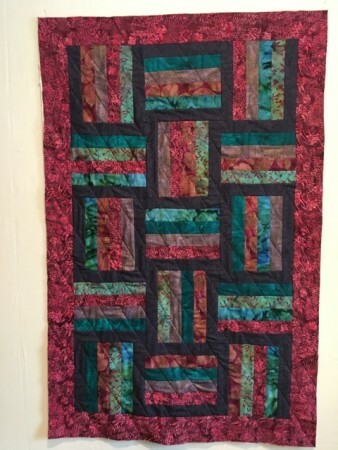 And, so this quilt occupies space on my wall. 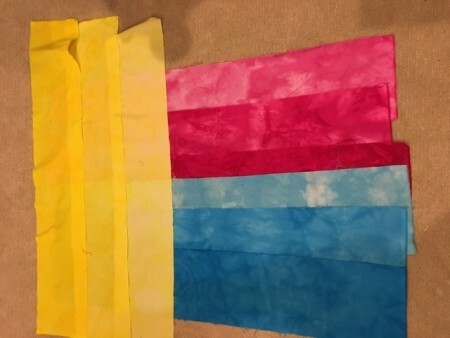 Another area currently has some fabrics laid out as I make a decision on the color way I want for my next art quilt. 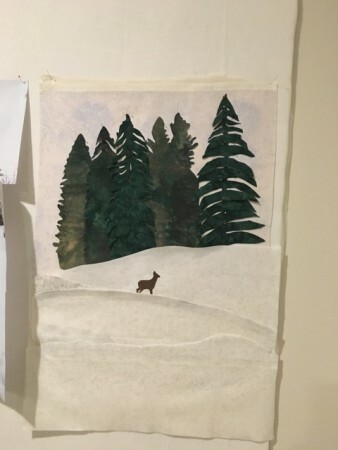 My ‘Wildlife’ quilt kept nudging other projects to make room as I patiently waited for my choice of fabric for its back to arrive. It did and the quilt sandwich is now assembled and awaiting quilting. But, quilting projects are now on hold. 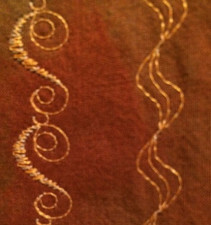 I have been quietly hand stitching away in the background these past weeks. As I finished up one small project, I got an idea for a new ‘pocket’ or pouch. I started on it last night and spent any free time today stitching on it. Perhaps by next week’s post, I will have it ready to share it and the other pieces I have been making! Linking, as always, to NinaMarie’s Off the Wall Friday blog. 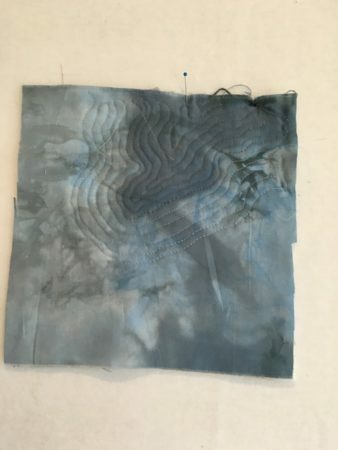 This was the first week of Elizabeth Barton’s Basic Dyeing for Quilting at Academy of Quilting. I am so relieved that she is taking a relaxed approach to teaching us. I was more than a little concerned that we would be overwhelmed with assignments. 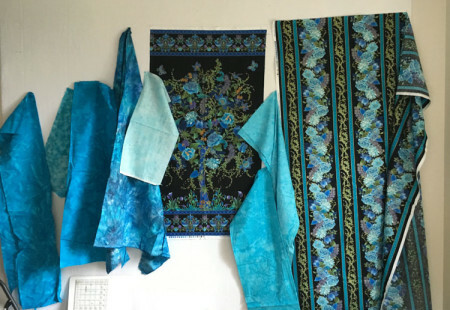 Fortunately, since often it is necessary to wait 24 hours before the next step in a dyeing process, it is acceptable to only devote part of each day to the class and still keep up. 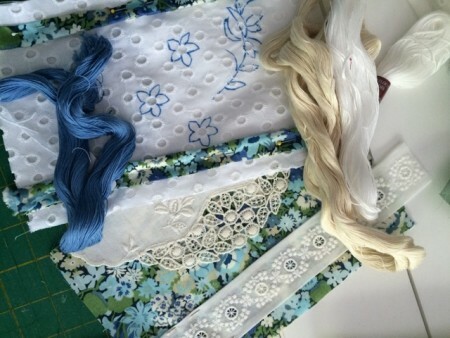 I am relieved since, of course, I am working on a number of projects at once. 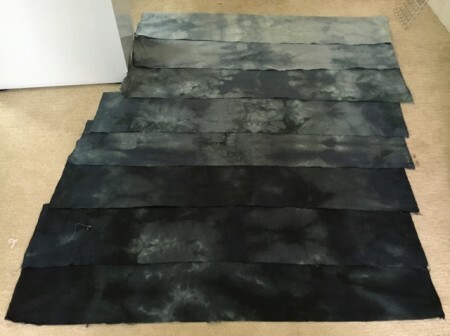 The purpose of this week’s class was to establish a work station and use it to mix the dyes we will need for the class and to do a gradation using a black dye. My ‘work station’ actually wound up stretching from the laundry room, where I had planned to work, to the neighboring powder room. I made the untimely discovery that the outlets in our laundry room do not work (call to builder in) and so I had to move my dyed material to the powder room to set for a day or two. This was necessary as the dye had to be in an environment of at least 70 degrees and my best method for achieving that was to move a space heater into a small area. It worked great and I was quite pleased with my resulting gradation. 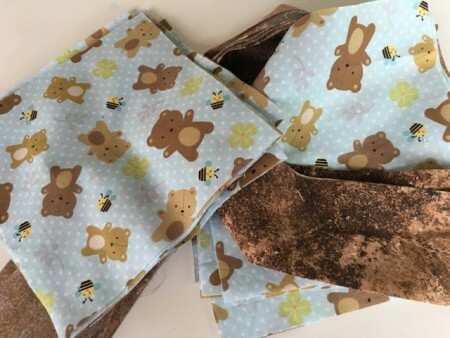 Whilst I was waiting for dye to set, I did continue with my other projects – probably a bit too ambitiously as I pretty much ran out of steam mid-week. My body kindly objects to overstress and so, I probably did not make as much progress on all fronts as I thought I might. 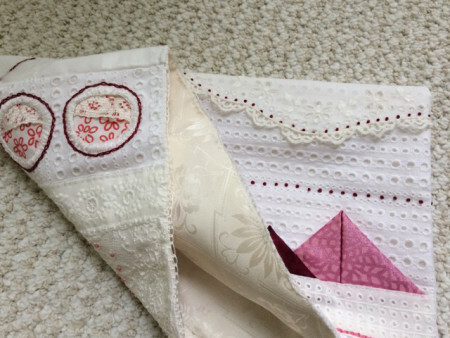 Then I think I mentioned that my daughter had expressed interest in a quilt for the expected baby due in March. We made great progress over the weekend on a pattern and picking out fabric, mostly from my stash. The pattern is called Basketweave by Bonnie Sullivan. Here is how it looked on my design wall as I assembled the cut pieces. In case you wondered about my Eiffel Tower project, well that did just sit. However, one of the women in my stitching class with Karen shared some excellent lettering that she had done. Lightbulbs went off and I now know my next step on that piece. It will just take me a bit to implement it. Finally, let you think I spent the entire week tied to my studio. 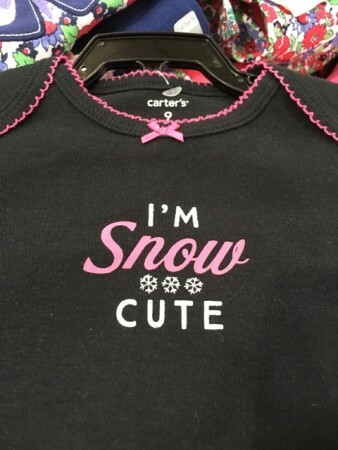 I did get to sneak out for a bit of shopping and found the most adorable outfit for a new born. On that happy note, I will link to Nina Marie’s Off the Wall Friday blog. See you next week! of encouraging us to appreciate the basics. 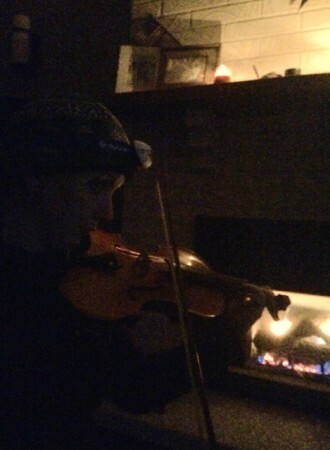 What you can just make out barely is my daughter’s violin as she and her husband entertained Judy Kate, me, and their four dogs with some Christmas tunes. We were all bundled in layers and huddled near their gas fireplace, having been without electricity and heat since 3 pm Tuesday. Why? The worst wind storm since about 1995 descended upon Spokane on Tuesday afternoon and by 3 pm the majority of homes were without power. Unfortunately as I wrote this blog on Thursday evening, lights were still out for many (41% of one major utility company’s customers). Fortunately, for us, my lights and those in my daughter’s home blazed on again about 4:30 am Thursday morning. Given all that was happening in the world outside Spokane this week, we were wise enough not to complain but to make the best of our discomforts and appreciate our relative good fortune: our properties received very little damage, my daughter’s in-laws offered us a hot breakfast (their power returned quickly), and our favorite take-out place was open by dinner. By Thursday mid-morning we were able to return to life more or less as we know it – a luxury not shared by Parisians or thousands of Syrian refugees today. And so, I found myself going through today with a deeper appreciation of all I have been blessed with. It is such a gift to be able to stitch and work with fiber again while being so close to some of my family. 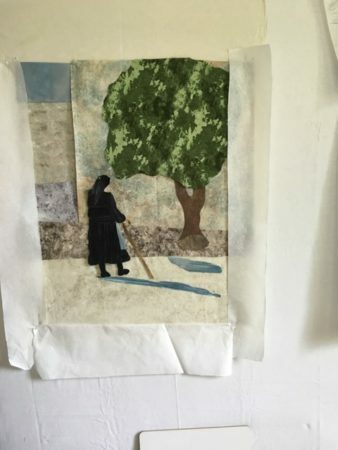 Update on my quilt from last week: I was able to continue to monitor my emails on my iPhone throughout the power outage and delighted to learn that Quilts Beyond Borders is sending the quilt I wrote about last week to a Down’s Syndrome School in Guatemala. And, a package is on its way to me with some fabric to use in two more quilts. So, I guess I have found a volunteer project to contribute to in our new ‘second’ home. Excellent timing I would say. 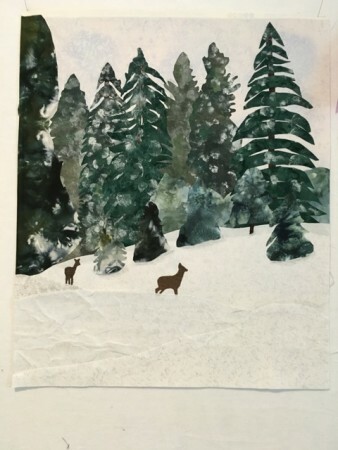 PS Linking to Nina Marie’s Off the Wall Friday blog – check out some other artists! A card with the above quote sits near my desk in my studio. It has been with me for many years. It flows with a belief that I have held most of my life that change happens one person at a time and, if we really want to effect change, then we need to do so one person at a time………and what better time to start influencing people to make good choices than when they are young! 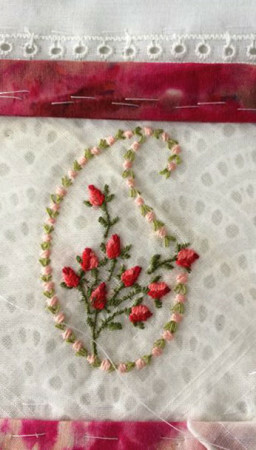 This past week seemed rather mundane in many ways for me –packing many boxes and just a tiny bit of stitching. But something happened tonight that reminded me of those core beliefs and all that I spent many years coaching people in with my friend, Tom Crum. 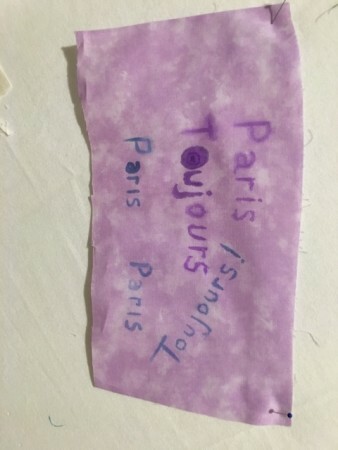 My dear granddaughter who will be four in September shared a ‘necklace’ that she got at school today. 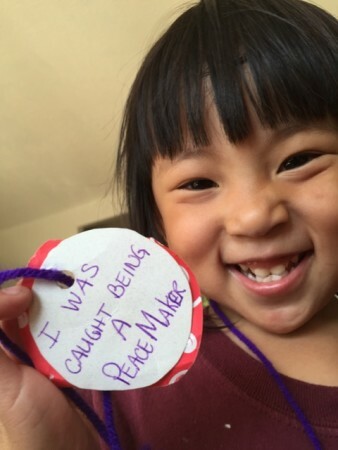 There wasn’t time to hear the story behind the ‘necklace’ but if my granddaughter’s preschool is acknowledging the kids in the Mighty Lions classroom for being peacemakers, I feel pretty good about our future prospects. And, that thought seemed worthy of a blog post! Plan Now for Urban Murmurs! I learned about a relatively new Call for Entry this week called Urban Murmurs. It immediately brought to mind Carl Sandburg’s poem which I learned as a child…I would be curious to know what images Urban Murmurs conjures up for you! I would also encourage you to check out the Urban Murmurs website. 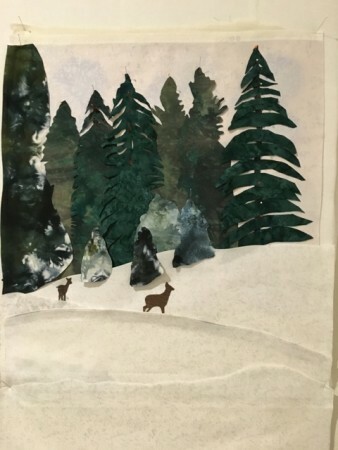 The juried exhibition is being sponsored by two friends, Julie Brandon and Val Schultz, whom I deeply respect and who create really high quality exhibitions. The exhibition will run from April 18 – May 20, 2016. Since the entry deadline is February 1, 2016, you have plenty of time to plan to enter. I can only hope that I will be in a position to submit an entry by February 1! Here is where most of my fabric stash currently exists. Is this all of it? Well no, only most of my quilting cottons. My handwork supplies are still filling my office and will probably do so till fall. But, I expect my time to be increasingly split between coasts as our second home nears completion, so I am beginning to box up what I can when I am in our NY home. 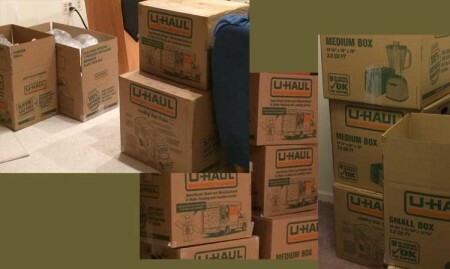 It will give me a better feel of the size of a load that will move out to the new house. What exactly did I accomplish in the past week? Well, I could go into details on easements and closet design, but that is not the purpose of this blog. 🙂 Time was pretty limited this week for stitching but I did manage to finish designing and stitching the side of the pouch that I was working on last week. Here is hoping that I have something to show on the other side of the pouch by next Friday! Linking up, as usual, with Nina Marie’s Off the Wall Friday. 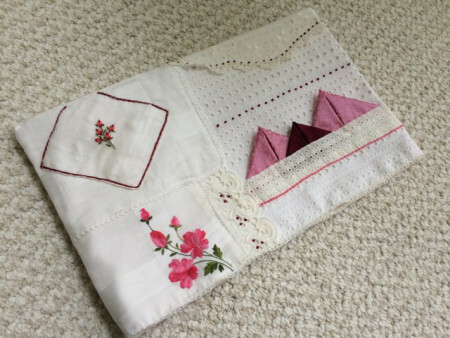 Last week I included a photo in a post of a picnic quilt that I made for my granddaughter. 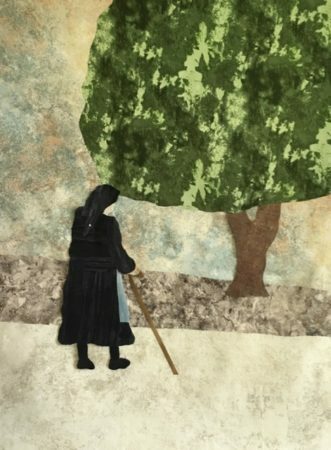 A number of my blog friends wrote expressing concern about treatment that the quilt might receive from said granddaughter. 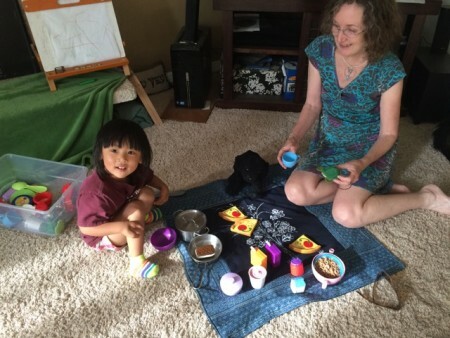 I thought you might enjoy a quick photo of the picnic quilt in action…Judy Kate served a delicious lunch to Raven and myself on the living room floor. Linking to Nina Marie’s Off the Wall Friday. 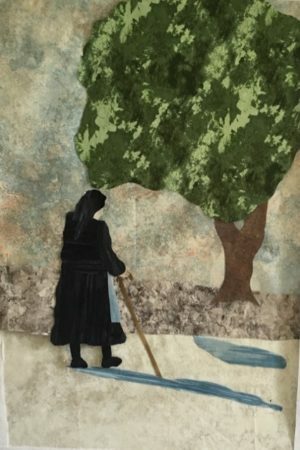 Hope you have a minute to check out some of work of other artists! 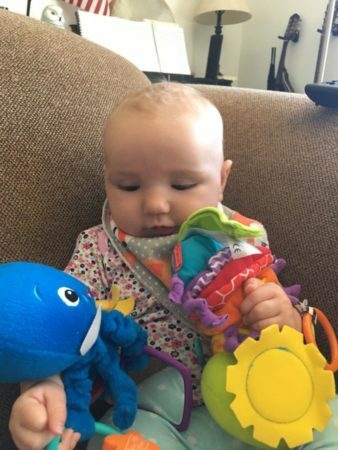 It has been a week of odds and ends: moving towards completions, laying groundwork for new projects, and throwing in a quick granddaughter gift! And, finally, a new quilted picnic blanket for my granddaughter. 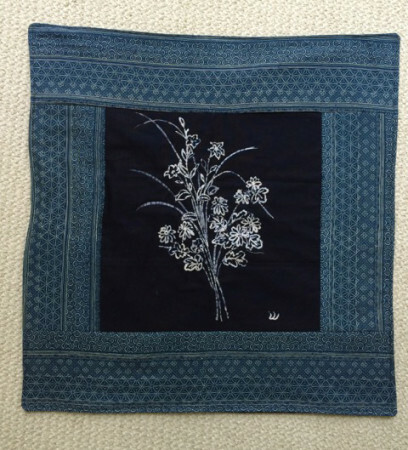 I screened the center flower image years ago in a workshop in Kyoto…It blended perfectly with some Japanese fabric given me by a student. It will receive hours of loving play as it hosts backyard picnics this summer with ‘seal’ and ‘Raven’. If we are lucky, we will all be invited for a cup of tea! Linking, as always, to Nina Marie’s Off the Wall Friday. You might recognize the bottom right images. That was my favorite from my earlier efforts. In exploring different value choices, I came up with these two. 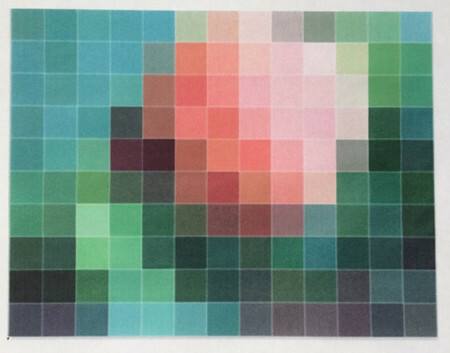 Elizabeth favors the top one for its Necker Cube effect – a new term for me which refers to an image where there is an ambiguous line effect which allows each viewer to interpret differently. I still like the lower of the two images but, the longer I keep that upper image on my wall, the more I can see Elizabeth’s point. I may just have to make both! Elizabeth did have a follow-up to this exercise as well as some additional exercises around color and composition. Unfortunately, I found the instructions for the follow-up exercise confusing and couldn’t come up with the right questions to gain some clarity, nor did illustrations from other students seem to help me either. That could always change but I am out of my studio the first half of May so any further work based on these grids or other exercises from the class will probably be on my own after the class ends. All-in-all I am happy with the class. I definitely learned a good deal, had a great deal of fun creating designs, and have a wonderful resource on modern abstract artists in the handouts. 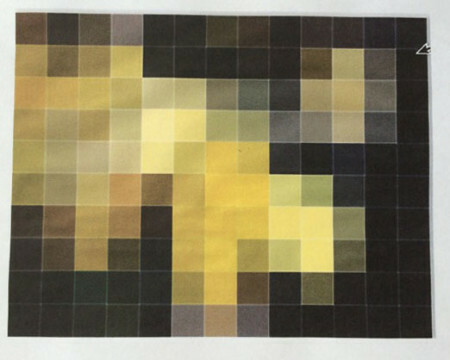 I also learned that many areas of abstract art design still do not hold a major attraction for me. The view outside my office no longer is snow, but it is still a bit bleak. No worries..the temperatures are slowly rising. Though the flowers are yet to emerge, I chose to start a small project that would remind me of their existence. 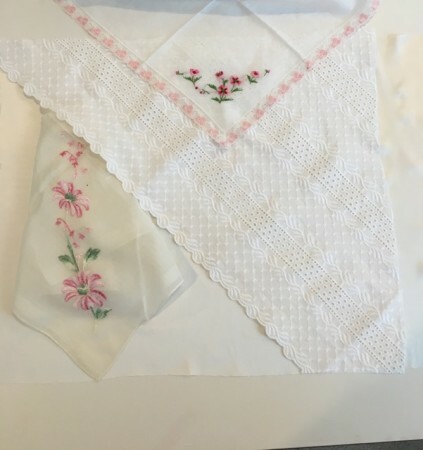 This burst of spring came from an antique hanky I had acquired, probably because I was attracted to the unusual design and the choice of colors to frame the flowers. 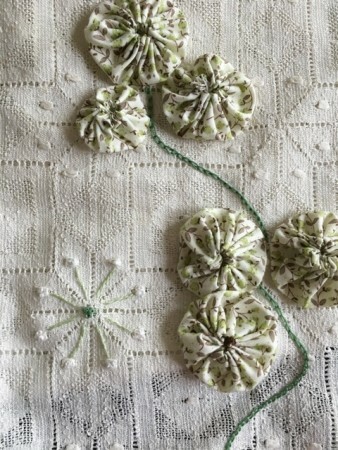 It shares the focal point with another smaller cluster of flowers on what will be the front of another pin pillow or perhaps a sack . Creating these smaller projects is great fun. 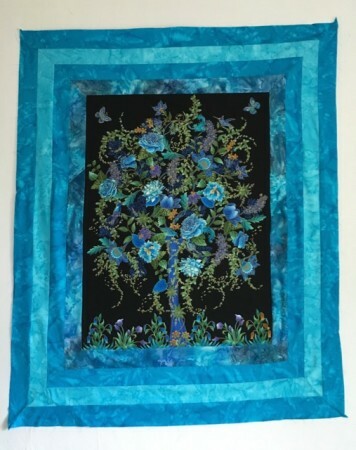 I start with an assortment of fabrics and hankies and noticed that one of my ice-dyed cotton pieces complemented the frame of the larger burst of flowers. Building from there, bit by bit, the layout emerged. 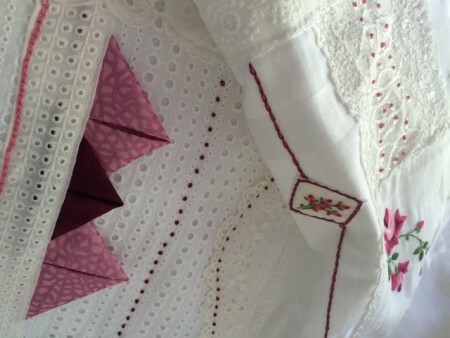 It wasn’t until I added that bit of lace trim near the bottom that I felt like I had a good foundation. 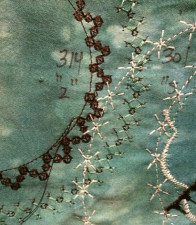 The actual stitching of this piece has just barely begun. A final version will emerge in the coming weeks, so you will have to wait. One of the reasons is the latest arrival in our home. 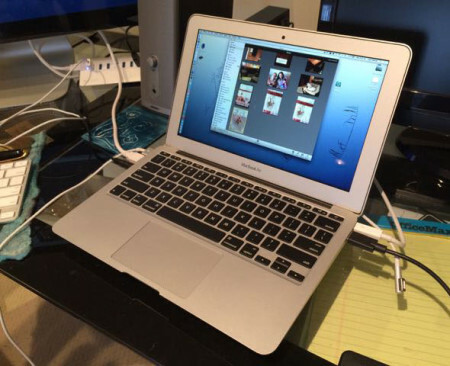 I have a new MacBook Air! I am so excited! The past day or so have been taken up with migrating from my MacBookPro and then getting all my peripherals working on the Air. I am already appreciating the increased efficiency of this machine – and will fully delight in its lighter weight as I trek back and forth across the country in the coming months! Most joyously, this acquisition marks the end of a computer-intensive quarter. I still have some re-organization of files to accomplish on my new machine, but, with the FFA website up and running, springtime promises more time for stitching! Yay! 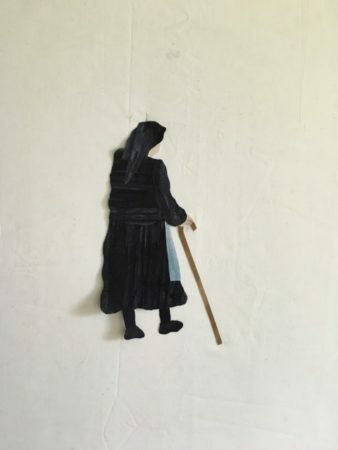 Linking, as always, to Nina Marie’s Off the Wall Friday blog. You may have gathered that I love my Irish heritage. 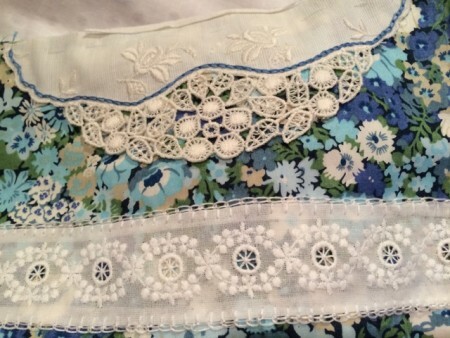 😉 So, when I was looking for some quick stitching projects I seized the opportunity to work with some Irish lace that I was fortunate enough to find in an antique store in Westport, Ireland. 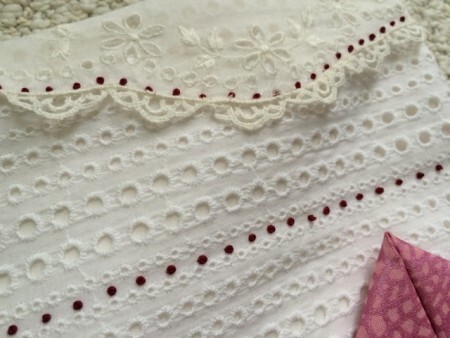 Combining the lace with a silk background and some embroiderie anglaise fabric in my stash, I had the makings of a small pin pillow. 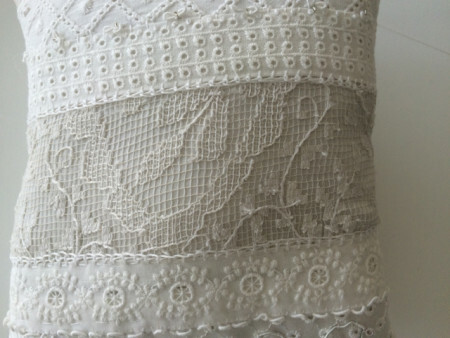 The lace was used for the mid-section of the pillow to give it a place of honor. 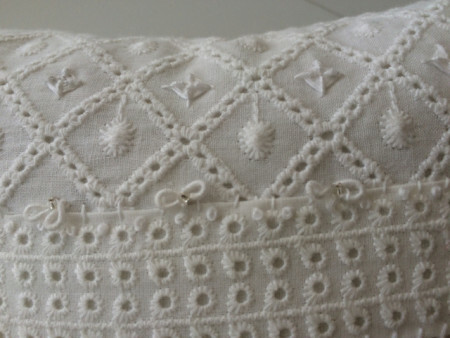 I used a variety of stitches including French knots and web stitches to embellish the rest of the pillow. 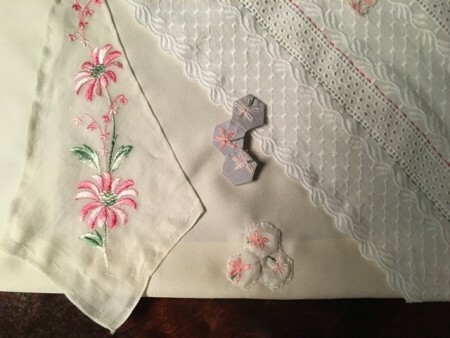 I used a few small beads to add a bit of sparkle among some of the bullion knots and to scatter amidst the gimp that adorned the lower third of the tiny pillow. 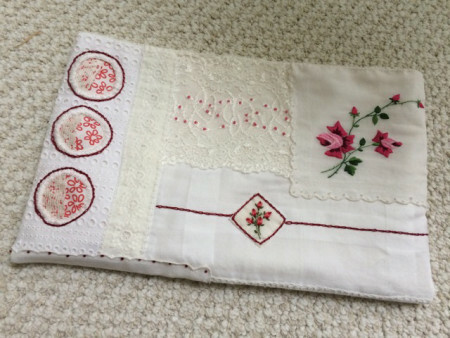 The pillow is already on its way to a special person to whom I hope it will bring a smile of pleasant memories. Linking to Nina Maries Off the Wall blog. 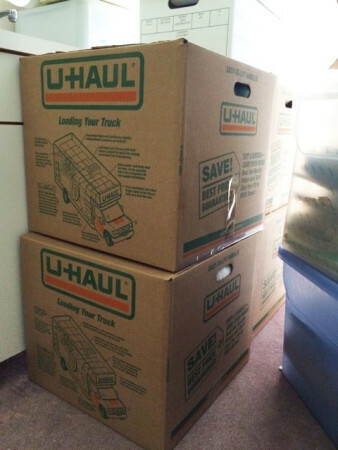 Quite honestly much of the last 10 days has been spent in front of a computer moving and deleting files in preparation to a move to a new smaller computer – smaller in size but also less storage capacity. It has actually been a fun trip down memory lane. My son, the SEO expert, laughed hillariously in a conversation when I admitted I had 23,000 photos on iPhoto. (I didn’t tell him how many were simply stored on the hard drive outside of iPhoto.) Moving the photos to an external drive has allowed me to review photos from the last 15 years or so and smile at the memories. However, not all my time has been at the computer. I have been cleaning and sorting in my studio. 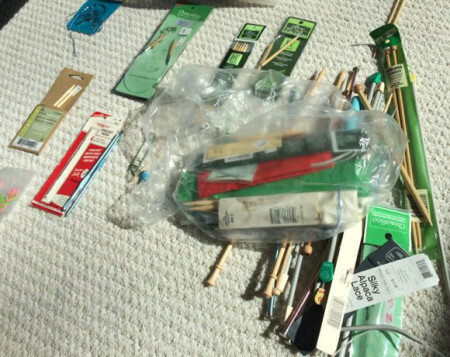 As I tackled one draw of yarn odds and ends, I discovered I had quite a collection of knitting/crochet needles. My cleaning also reminded of some saris that I had brought back from India because I really liked the cloth patterns and had been sitting for two years on a shelf. I decided to put one to good use and create a storage holder for my knitting paraphernalia. 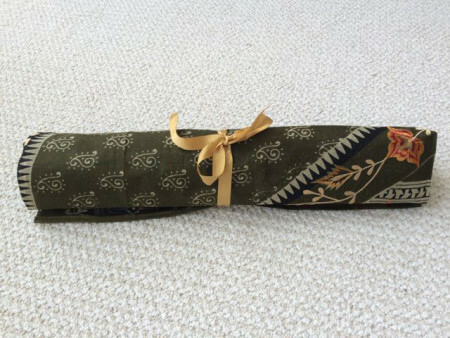 I cut one end of the sari for the front of the holder. 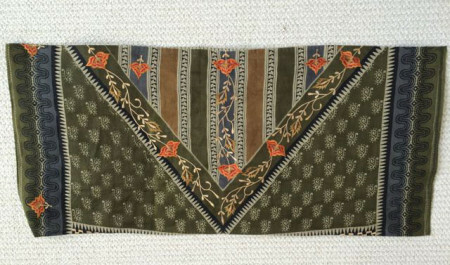 And laid out a possible arrangement of the needles on another piece of the cloth. When something is simply for me, I tend to work intuitively without a lot of planning. 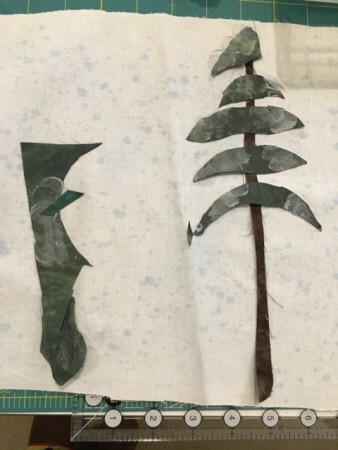 I spent some time guess-timating and cutting for holders. It was actually quite easy and soon I had a finished storage pouch. It rolls up quite nicely and is easily stored away for my next project. And now back to the computer work! Linking to Nina Marie’s Off the Wall Friday. Remember to check things out. I had put together the makings from some smaller projects to take on a trip that didn’t happen. So, I decided to follow through with some of them at home. 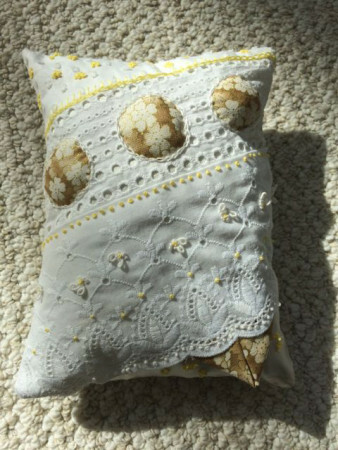 One result is this cheerful little pin pillow. I chose the yellow tones to brighten up my days as I stitched. Perhaps Mother Nature took the hint as there was a lovely display of sunshine on my living room floor as I photographed this! 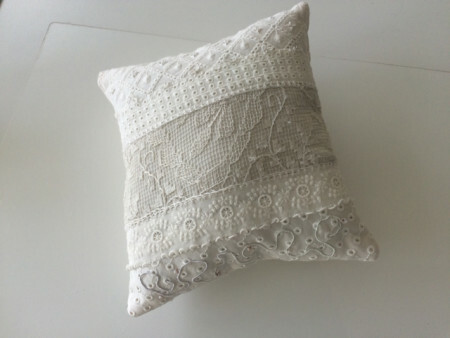 I got the idea for the little cushion from Karen Ruane, my online stitching instructor and friend. She calls them pin pillows and they do work quite well as what we in American would call pin cushions. However, I have also found them to perfect for other purposes. One of mine is now a pillow for a certain stuffed animal that sleeps in my granddaughter’s home. I am using another as a resting spot for my eyeglasses which I unfortunately need to reach for first thing in the morning to find my way through a day. Speaking of Karen, she is offering a new class in April which deals with what she calls ledgers. 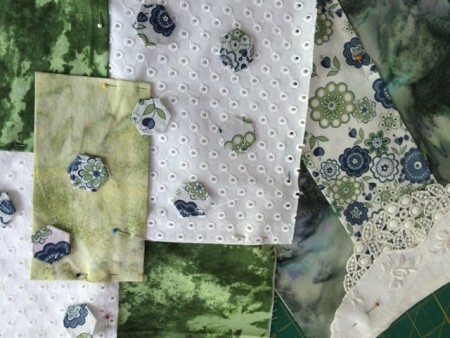 It is about creating paper journals of ideas for projects, patterns, stitch combinations that you might like to explore. 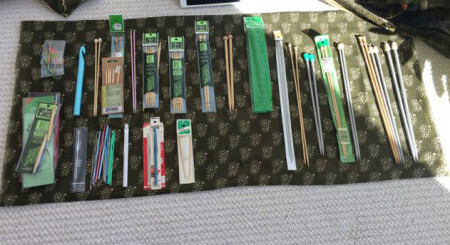 A unique idea for those of us who like to just plunge in and start cutting and sewing! As always, the material is presented through a series of videos where the student is ‘a fly on the wall’ while Karen stitches and chats. I find it a very effective learning method for me. If you want to learn more, you can visit Karen’s website. I was overjoyed with the response to my query last week on To Crop or Not To Crop. Thank you so much for taking the time to share your perspectives with me. 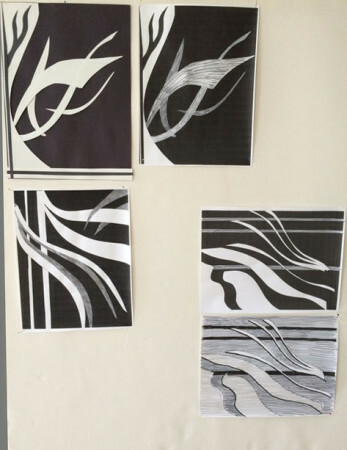 When we create a piece, I can get so tied into the process and critiquing it that I fail to see the finished project. That sounds funny but it is true. I look at what I have created and I see the areas where my stitching wasn’t quite up to par. One of the fun results of asking for opinions was hearing what each of you saw in my piece. I waited a few days and considered all the different viewpoints. Then I stepped back and made a decision. Here is the final piece. It wasn’t easy to decide. But, in the end, I decided to go with the version that best caught what attracted me to taking the original photo – the flow of the water around the two rocks. 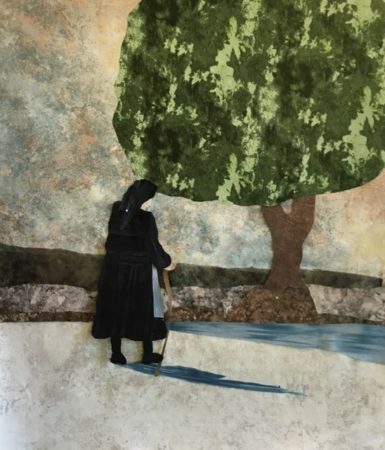 Linking to Off the Wall, Friday with Nina Marie Sayre so please check out what other artists have been doing.